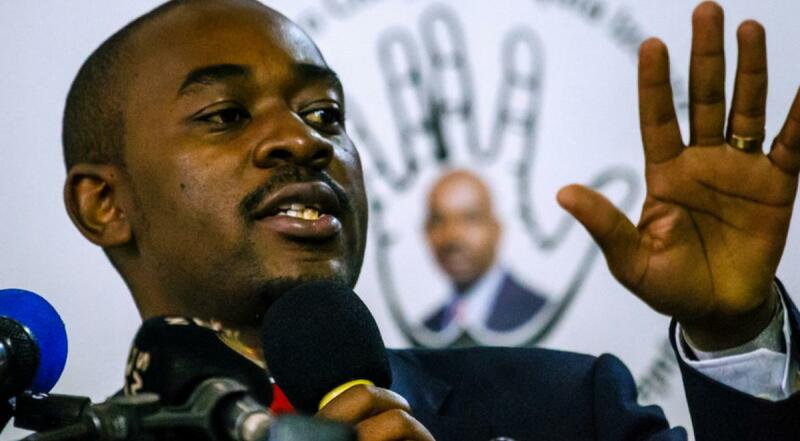 Zimbabwe’s main opposition leader, Nelson Chamisa, said on Thursday that he had won the presidential election, and President Emmerson Mnangagwa knew he had lost otherwise the results would have been announced by now. In his first public appearance since the vote on Monday, Mr Chamisa, leader of the opposition Movement for Democratic Change (MDC), urged his supporters to be calm and await “massive celebrations” for his victory. Mr Chamisa said he could not give any figures because he would be breaking the law. Earlier, police sealed off the headquarters of Zimbabwe’s main opposition party and troops cleared the streets of the capital, day after protests over a disputed presidential election ended in deadly violence. The security forces acted despite calls from foreign governments and international organizations for calm and for political leaders to show restraint. The result of Monday’s presidential election, the first since the army ousted Robert Mugabe in November 2017 to end four decades of authoritarian rule, had still not been announced by Thursday afternoon although the electoral commission said it would do so “very soon”. On Wednesday, Mr Chamisa accused the ruling ZANU-PF party of rigging the poll, although he offered no evidence. Opposition supporters took to the streets to demonstrate and three were shot dead by soldiers amid clashes. The army crackdown has punctured the euphoria that followed its removal of Mugabe, and fueled suspicions that the generals who launched the coup remain Zimbabwe’s de facto rulers. In Harare, the contrast could not be stronger with November, when hundreds of thousands filled the streets, hugging soldiers and celebrating their role in ousting 94-year-old Mugabe, the only leader Zimbabwe had known since independence in 1980. “They are showing their true colors now. We thought they were our savior in November but they fooled us,” said newspaper vendor Farai Dzengera, saying that the brief dream of an end to decades of repression was over. MDC Secretary-General Douglas Mwonzora said 27 party workers carrying out voter tabulation were locked inside its offices as police sealed them off on Thursday. He said he suspected police wanted to plant evidence to incriminate officials. “We will not recognise that search warrant because they want to plant evidence. They want to disrupt our results tabulation process that’s all,” he said. “The police are there to do their job,” police spokeswoman Charity Charamba said. Nearly all shops in downtown Harare were shuttered and the normally bustling pavements quiet the day after the bloodshed. President Emmerson Mnangagwa’s spokesman, George Charamba, insisted that Thursday was a normal working day. “They must go about their business as always,” he said on state television. Wednesday’s violence, which followed a relatively orderly election, dashes Mr Mnangagwa’s hopes of repairing the image of a country that had become synonymous with corruption and economic collapse under Mugabe. In particular, the use of soldiers to control the capital confirms suspicions that the generals who ousted Mugabe – including army chief-turned vice-president Constantino Chiwenga – are firmly in charge, analysts said. “Deployment of troops reveals the uncomfortable truth that, eight months after Mugabe was ousted, the army remains the pre-eminent political force,” said Piers Pigou, a Zimbabwe expert at the International Crisis Group think-tank. The election, which pitched 75-year-old Mnangagwa against the 40-year-old Chamisa, was supposed to confirm the legitimacy of the post-Mugabe government and allow Harare to renew ties with the international community. This in turn would have allowed it to start unlocking the billions of dollars of donor funding and investment needed to get its economy – at independence, one of Africa’s most vibrant – back on its feet. Instead, observers from the Commonwealth, the group of mainly former British colonies that Mr Mnangagwa had been hoping to rejoin, did not mince their words in condemning the conduct of the military. “We categorically denounce the excessive use of force against unarmed civilians,” former Ghanaian president John Mahama said in a statement on behalf of the Commonwealth. He also urged the electoral commission to speed up the announcement of the results of the presidential vote. The observers had on Wednesday reported a number of problems with the poll, including voter intimidation. The United Nations and European Union both called for restraint, while Britain, an unashamed cheerleader of the “new” post-Mugabe Zimbabwe, said it was “deeply concerned” by the violence. China, an important source of funding under Mugabe and Mnangagwa, said however it believed the election had generally proceeded in an orderly fashion. A foreign ministry spokesman “noted” reports of Wednesday’s unrest. Mr Mnangagwa, a former security chief nicknamed ‘The Crocodile’, offered his condolences to the families of the victims of the crackdown and said those responsible would be brought to justice. He said he had been talking to Mr Chamisa to try to defuse tensions.